Not really because my schedule is different every day but I can give you an example. I get up, have breakfast and go to work. Then I come back home, have lunch and prepare for the next class or work on my projects. Sometimes I have to go to more classes. After that, I go to yoga or the swimming pool several times a week, and on other days I just come back home and work some more, learn, read or surf the Internet. I work part-time so I’ve got quite a lot of time to do all these things. I love reading. Sci-fi is my favorite genre but I also enjoy non-fiction books. I also watch t.v. series and stand-up comedy, go out with my husband and friends or invite people over. Being with people I love brings me joy. I believe it’s the most important thing. I learn math and astronomy, but I don’t know if that counts as relaxation. It helps take my mind off the routine and teaches me how to think in new ways. Meditation is important because it helps me to deal with any emotions and accept things the way they are, see them as fleeting sensations and ever-changing events instead of getting trapped in them. Yoga clears my mind. It’s also important to have a longer rest once in a while, so it’s nice to go away for a weekend and visit my family, hike in the mountains, take a road trip in a foreign country or just spend time in nature. It helps me to disconnect, recharge my batteries and make some mental space for creative ideas. 4. You took on the tremendous task of writing an e-book and designing an online course. Can you talk a bit about it? It started with an idea to make an English course for upper intermediate and advanced students (http://greenzebra.club/). I underestimated the time and effort it would take. In the beginning, I often worked at night to finish every lesson on time, and it was a source of tremendous stress for me. I had to learn many new things and at times it felt like all my work was for nothing. Then I decided to make the Vocabulary Workbook as an addition to the course. Creating the exercises was the fun part, but designing and publishing the book was a nightmare. There were times when I banged my head against the wall because I had to remake and redesign a lot of stuff. When it was done, I stepped back and had a break which turned out to be valuable as I looked at it from a different angle and saw what could be improved. I’ve recently changed the cover and the concept a little. 5. How did you come up with the idea for your e-book? I made many exercises for my students to help them learn vocabulary and grammar. I thought it would be nice to share it with other people so I made a blog with lessons in Polish (https://lekcje-angielskiego.edu.pl/). Then I decided to make a course in English so that more people all over the world could use it. 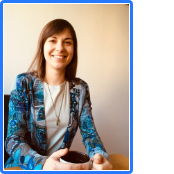 I'm a language learner as neither English nor Polish are my native languages so I used the techniques and tools that proved effective for me and my students in the course. The course is free, but initially, I had this idealistic idea that I would ask people to pay as much as they saw fit at the end when they already knew its value. That didn’t work. Then I came up with the idea of a vocabulary workbook that I could sell as additional material. The key task of the course is to watch original videos in English and learn advanced vocabulary from them, so there are quite a lot of words to master. That’s why I made a workbook with effective exercises to help students memorize the vocabulary. There are also creative tasks to make things more fun and lots of revision as I know it’s impossible to learn anything without it. The students get interactive flashcards with images, usage examples and pronunciation recordings of all the words. 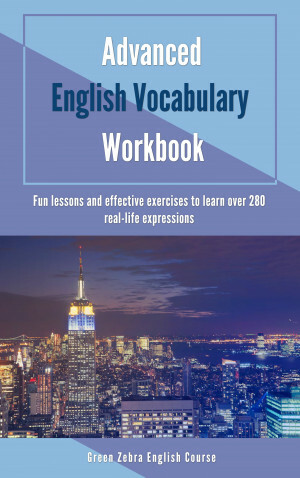 The book is perfect as an addition to the course, but the cool thing is that it can be used separately by people who want to learn real-life, advanced vocabulary or teachers looking for materials. 6. You managed to balance teaching and working on your e-book and resources? What is your best productivity tip? What has proven effective in being productive and focused is writing a plan for the week. If I know what I have to achieve by the end of the week, I have the motivation to do what needs to be done. Every evening I write down what I’ve done that day. At the end of the week, I analyze my achievements (what worked and what didn’t and why) and create a plan for the next week taking it into account. I’m experimenting with minimalist journaling (https://betterhumans.coach.me/draft-how-to-hack-your-brain-to-achieve-consistency-that-lasts-7f5fdc520d28) where I create this visual dashboard of boxes for each day and have my own symbols for the things that I want to do. Knowing that I’ll have to put something there in the evening motivates me to do the right things during the day. It’s also important to sleep well. You can’t be really productive if you don’t get enough sleep. Good food and exercise are essential too. You don’t have to go to the gym but you absolutely have to move. Find the balance between working, taking good care of your body and mind, and spending time with people you love. It might be hard, but experiment and see what works for you. Don’t try to push too much into one day or week. You’ll get overwhelmed, exhausted or won’t even start because you’ll be so intimidated. Start with small steps and gradually increase the time you spend working on your project. You will learn about your capabilities and limitations. It's important to listen to yourself and adjust your routine to your needs. 7. Where can teachers and students purchase your course and e-book? 9. Do you have any plans for other teaching resources? Yes, I’ve gathered some feedback and learned a lot from making the first course so now I want to use this experience to make a better one. It’s going to be focused on building habits that will allow students to keep learning on their own. My free course also has this feature but it requires a lot of determination and self-discipline from students. I want to make it easier and intuitive. I’m also going to use science-based effective learning techniques to maximize the results while minimizing time and effort. 10. How do you promote or market your resources? I run accounts dedicated to my course on Facebook and Twitter. I post interesting stuff in English since the idea of the course is to surround yourself with English and consume as much as possible. I also run contests, offer discounts and share news related to my projects. 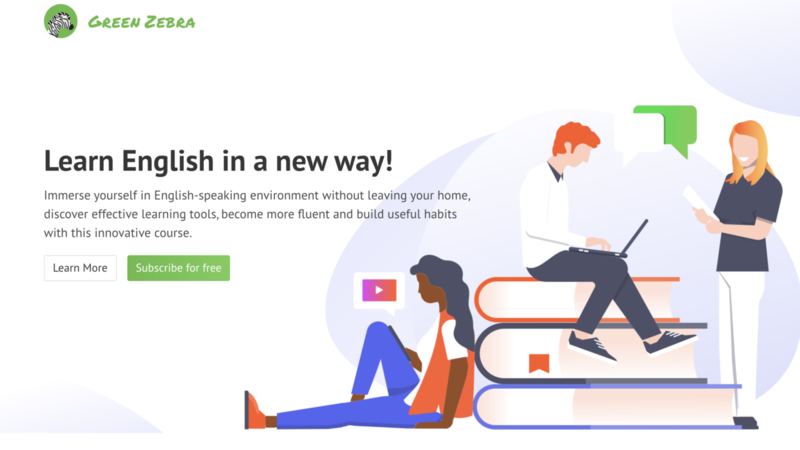 I write blog posts about language learning on Medium. Marketing is something I have to work on. So far I’ve been doing everything myself, except for the website, but if you have the resources to hire someone, I believe it’s a much more efficient way. There is only so much one person can do well, and learning new skills takes time, even though it’s often fun. Working in language schools I have to prepare lessons on my own, so this helped me create both the course and the book. Finding interesting materials in English and building language learning activities around them and preparing exercises to help my students memorize new vocabulary were the key things. I also discovered Anki (https://apps.ankiweb.net/) as an extremely useful tool to learn new words, so I created flashcards with the help of the program and used them as an addition to the book. Practically everything I’ve done has been outside of my comfort zone. I had to learn how to set up a newsletter, create marketing materials and graphics, run social media profiles, design and self-publish an e-book and a paperback. It has also been a lesson in embracing failure. I had to learn how to find balance and enjoy the process of creation instead of stressing about it. I had to build a lot of resilience and learn how to deal with negative emotions when something doesn’t work the way it should. I’m still working on that. I don’t want to sugarcoat it, fear and doubt are natural and reasonable. If you want to start a project of your own, it’s going to take a lot of time and effort. It will probably be years before you get your first significant results. You may fail many times before you get there. You’re going to make many mistakes. It’s going to be hard and you are going to deal with things that only people who do their own projects deal with. I think it’s important to realize that before you start so that you can think everything through. The good news is that there are some other things that will happen that are positive: you will learn new skills that you wouldn’t have learned otherwise. You will meet new people, and who knows how these acquaintances might influence your life. You will build resilience and strengthen your character as you face challenges and that will definitely pay off because life is full of difficulties. You’ll become more organized and determined. You’ll have to forage for clues outside of your comfort zone. Overall, you’ll learn extremely valuable lessons and change your life in unpredictable ways. You will become stronger and wiser. You’ll grow. Besides, maybe your first project will fail (they often do), but with all the experience you’ll gain the next one might be a huge success. No one can guarantee that you’ll succeed, but if you try, you have a chance. If you don’t try, you’ll never know what could have been. 15. Is there anything that you would like to add? Thank you for the interview, it was fun! And to everyone who’s reading it: be happy, enjoy your life and take small steps in the right direction every day. Thank you so much for sharing your journey. You have accomplished a lot so far. Keep me posted on future resources.